One of the unsung influential figures in the recent history of Farnham died peacefully on June 5 2001. 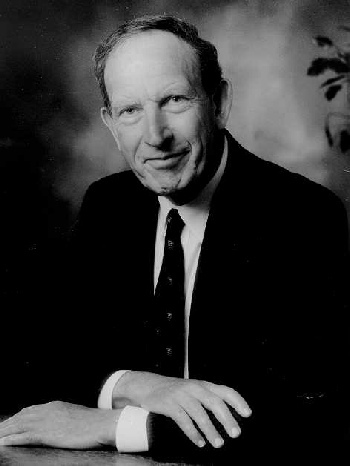 Paul Wilfred French (70) was the first principal of Farnham College. He was appointed to Farnham Grammar School, as its last headmaster in April 1971, with the task of merging it with Farnham Girls Grammar School and creating an Open Access Sixth Form College. The first one in Surrey. The mood in Farnham for the new venture was tinged with scepticism rather than enthusiasm. Paul French arrived with an impressive track record. A Cambridge mathematician with a later acquired Masters degree in Computing Studies, he had taught previously at Maidstone Grammar School, Dulwich College and the Cavendish School, Hemel Hempstead. As a Surrey man he was almost coming home. He was brought up in Haslemere and attended Godalming Grammar School where he met his future wife, Dorothy. His intense dedication to the task facing him ensured that the Grammar School pupils did not lose out as they worked their way through the college, and equally that the girls and staff of Farnham Girls Grammar School were placated for the move from a modern building to a much older one and its attendant huts. Superimposed on the endeavours was the creation of an open access Sixth Form College - a totally new concept in much of the country and certainly in Surrey. With a great deal of hard work and determination Paul French oversaw successfully the creation of the new institution. Farnham College became the Mecca for visitors from other developing Sixth Form Colleges both in Surrey and elsewhere. The blueprint was widely copied. His computing skills ensured that the college enjoyed a computerised administrative system that was in the forefront of what was possible in the 1970s. Above all Paul French was a man of educational vision. He saw clearly the excitement of the challenge of the new Sixth Form. He understood the importance of inner motivation of the student. Whilst in no way under-estimating the importance of examination success and paper qualifications he realised that education was much more than these. He was concerned about unexaminable factors - maturity of judgement, sense of humour, self control, a sense of values, purpose and integrity. With these in mind he felt the tutor-student relationship to be of great significance. His door was always open to staff and students. He was at his most relaxed in philosophical discussion, which he enjoyed greatly. He was determined not to be solely an administrator and taught mathematics and general studies throughout his time at the college. He always encouraged people to think about what they were doing. In the 1980 he set up termly meetings with staff and governors to discuss various aspects of the college's life and philosophy. By the late 1980s it was clear that under the local management of schools, the compulsory devolution of most financial management away from LEA to staff and governing bodies did not appeal to Paul French and he chose to retire - a little early - at Easter 1990. He left behind a flourishing college which had laid to rest the fears of the early 1970s about the benefits of re-organisation. His successors were able to build on the firm foundations which they had inherited. In his retirement Paul French, essentially a private man, continued to make music, play tennis and to teach mathematics - his real love. In recent years he was dogged by ill health. He leaves his wife Dorothy, his four children, Sally, Rachel, Helen and James, and 12 grandchildren. A thanksgiving service will be held on Sunday 24 June at 3pm in St Andrew's Parish Church.